Motivation is that catalyst that is important for achieving something. If you are not motivated enough to do things, often it so happens that you end up not doing it or giving up. There are so many things people derive their motivation from, some derive from people, others from quotes, some from themselves. Let us today, have a look at some of the questions related to motivation. I think my dreams motivate me. The image that I get of myself, that I am going to be successful, the image of what life will be after that, it just makes me going on. Most of the times I am self motivated, but then there are days when I feel truly exhausted and lost or worn out. It is in those days that I seek motivation, either from the letters that I have written to myself or from the quotes of successful people, or most probably through some songs. Writing for me requires no motivation, I can do it just like that, because it is so much fun doing it. ” The life that we are living,the world that we are living in, was created by people no smarter than us. And if we don’t like it, we can change it. ‘. This was something said by Steve Jobs, and I find it very motivating because it tells me that I can make the change as well. I have read “The Secret” by Rhonda Bryne and I think it is one of the most motivating books that I have read. I tells you that whatever is happening to you is what you have thought for yourself and when you start thinking in some other way, you can change the things, and the events happening to you. I think motivation comes from within. Yes, definitely there are outside factors also. Like, a person who reads Steve Jobs or Mahatma Gandhi is likely to get motivated but to be able to move with it, to remain motivated, focused on your goal it requires, motivation,the one that comes from within. The determination to do things. I think no one can help a person without any motivation, because it is the most important thing to be able to do something. A person with no motivation is more likely to fail, but, what we can do is, show them the life of people who fought back failure, loss and death and can out alive. Like, Steve Jobs, the one man who was kicked out of his own company, built up a new empire. And then Colonel Sanders and Abraham Lincoln who gained success in the later years of their lives. I workout everyday in the morning. I go out for jogging and then do some sort of stretching. I think the best way to motivate yourself for work out is to imagine yourself young and old. When we are young it is so easy to do things, jump off and dance, but then as one goes old it becomes so difficult. But, it is only when the young work hard, work out that they can remain young for a long time. There are few songs that I listen for motivation. One of them is “Brothers Anthem” and then there are several others like “drag me down”, “I bet my life” and “roar” . Do you think motivation posters in offices help? I think too an extent they do help because they remind of what we are doing. Even these bring lot of positivity along with them. But, it is only useful if the person is motivated from within. If there is no motivation within, then there is no point of any motivation poster. What is the longest time someone has managed to go without Night sleep? Which phrase is used to refer not having enough sleep? How does the sleep deprivation effects the work of students? Which phrase is used to describe the situation when one can sleep on bed even after spending the usual time? Which words are used to describe the temper of students by Friday? What is the meaning of the expression ‘tempers are frayed’? What describes the feeling when one did not had enough sleep? Which two aspects get affected because of sleep deprivation? Under which condition do people weigh too much for their height? What was the age of Andy Gardner when she broke the record for least sleep? KELLOGG’S USES A cartoon tiger and elves to sell $14 billion dollars worth of refined carbohydrates each year. But this calorie-laden corporation was once an idealistic startup. Created by the eccentric Dr. John Harvey Kellogg, Corn Flakes were intended as a health food that made it easier for the masses to adopt a vegetarian lifestyle. Kellogg’s was the Soylent of its day. Today, Pfizer is a $188 billion dollar drug conglomerate. But there was a time when the biggest of “Big Pharma” companies was a lot like today’s Young Turks. At the time of its founding in 1849, when it produced small batch citric acid, the company was based in Williamsburg, Brooklyn, and its founder favored funky facial hair. Pfizer and the majority of the top 25 global pharma companies were founded in the period between 1849 and 1901. Notable companies sprung up in the 20th century, but to put it in perspective, as many top pharma companies were formed prior to 1781 as after 1981. First mover advantage is debatable, but it is clear there is value to being early to an emerging industry. These companies built solid products, established distribution channels, and value accrued to their businesses as a result. Regulation also played a role. In 1906, the US Government established the Food and Drug Administration, and the increased regulatory scrutiny to ensure safer medicines made it to market, but this oversight also made it harder for upstart companies to enter the market. This pattern is seen in most industries as they develop—food, automobiles, banks, TV network—all followed a similar pattern. A new technology, distribution channel, or demographic trend created a boom of startups. In relatively short order, a small group of companies enjoyed outsize success and bought their former competitors, or otherwise went on to dominate their industries. Market dynamics and regulations helped to cement the winners. This could happen with tech as well. Intel was founded in 1968, Snapchat in 2011—roughly 50 years apart. Don’t be surprised if our great grandchildren still use Google products 100 years from now. We’ve seen so much upheaval in tech over the last few decades that there’s always an assumption that past is prologue. Apple is doomed to lose to Android because it failed to embrace “openness.” Friendster and Myspace became uncool, making it a fait accompli that Facebook is doomed to do so once the patina of popularity wears off. Plenty of big tech companies have failed, but many of those examples can be chalked up to the immaturity of the tech stack, a lack of infrastructure to support a web-based business model, e.g. AdTech, or even just poor management. Paul Graham’s essay, “The Refragmentation,” makes a case that the era of big companies is coming to a close. Don’t be so sure. Craig Newmark and a team of hippies in the Haight upended print journalism across the country by decoupling classifieds from reporting. For the last decade, hundreds of millions of dollars have been invested in companies chipping away at Craigslist’s services. Airbnb alone is worth tens of billions of dollars. Yet Craigslist, with its laissez-faire approach to product improvement, remains the number 11 site in the United States. The value of liquidity in a marketplace, often earned by solving a problem early on, shouldn’t be underestimated. Can you imagine the longevity that Google, Apple, Facebook, and Amazon will have? How certain are you that a company will be able to upend Apple’s manufacturing prowess? Who will be able to outthink Google’s massive machine learning engine? Amazon has spent 20 years building the foundation of a retail empire that could last a century. These are not inconsequential advantages. Yahoo would seem to be a counterexample, but looked at another way, it’s amazing that a company whose entire raison d’être disappeared in 2007 has been able to survive for 20 years without a clear direction and saddled with a series of CEOs who were ill suited to the business. Instead of assuming these companies will fail, entertain the alternate position. Imagine we’ve just seen the establishment of companies that will dominate their industries for the next century, in much the way that General Electric, Ford, and Disney have only become more powerful and influential in the absence of their iconic founders. Some might view the age of “Big Software” as a bad development. In fact, this could be an amazing development for entrepreneurs and investors alike. Conglomeration hasn’t hurt entrepreneurship in pharma or food. In fact, it has accelerated it. In the biotech world, it’s not uncommon for a startup to go from drawing board to multi-billion dollar IPO in a few short years. Editas was founded in 2013, IPO’d in 2015, and currently has a market cap in excess of $1B. In the first half of 2015, there were six biotech IPOs in Boston, and the average employee count was just 17.5. This analogy isn’t perfect—bits and biologics have big differences—but the general trend is instructive. Mature industries tamp down outlier exits, but make entrepreneurship more efficient. The reason behind creating Corn Flakes was to drift the masses towards a vegetarian lifestyle. In the founding year of Pfizer i.e. 1850, Pfizer produced critic acid. 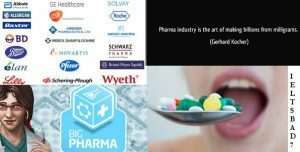 Majority of the global pharma companies were built in the late 1800. The increased regulatory pressure on pharma companies led to the fall of Pfizer. The failure of apple can be devoted to the success of Android. It was in the year 1968 that Intel was found and then Snapchat in 2012. The only reason behind the failure of companies is AdTech. 8. Who has acknowledged that the era of big companies will be soon overlaped by something else? 9. What is the ranking of Craglist in United States? 10. In which year was Editas founded? 11. What different dating sites are owned by Match Group?